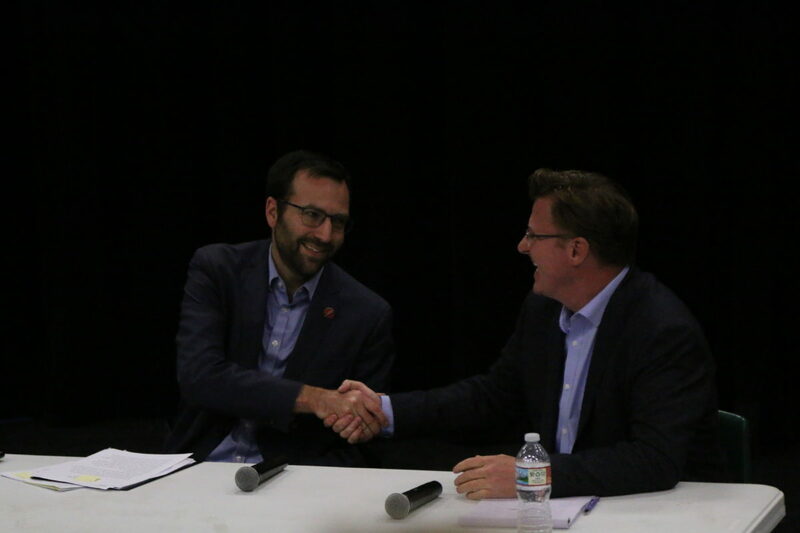 Incumbent State Senator Ben Allen and challenger Baron Bruno shake hands at an Oct. 10 candidate forum. Photo by David Mendez. This year’s State Senate race, between incumbent Democrat Ben Allen and independent Baron Bruno appears to be a contest only in the strictest definition of the term. Its contestants seem to know it, too. Forums between Allen and Bruno have been congratulatory affairs: Bruno is soon to marry his fiancée, and Allen’s wife is due to give birth to the couple’s first child. “There’s a lot of mazel in the room,” Allen said. “If your boy needs your time, then I’m more than willing to fill in for you,” Bruno quipped. This is Allen’s first defense of the Senate District 26 seat, which he won in 2014. Bruno last ran for office in 2016, for the Assembly District 62 seat, losing as a Libertarian in a landslide. This race isn’t likely to be close, either. Allen trounced both Bruno and Libertarian Mark Herd in the primary, taking 76.7 percent of the vote, compared to a combined 23.2 percent. Money isn’t everything, but it says quite a bit in political campaigns. Allen, as of Sept. 27, has taken in $1.1 million. Bruno has collected $4,400 this election cycle, all from one donation. Bruno has said he wants to give voters a choice other than the “Pepsi or Coca-Cola” of the Democrats and Republicans. “This election is about people helping one another and not giving the government the first right of making decisions for you and your family, and what’s best for you, when you can and can’t do things,” Bruno said to the assembled members of the Palos Verdes Chamber of Commerce in September. “Well, Pepsi and Coke are both bad for you,” Allen said.